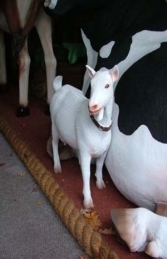 Our replica Goat is made of resin and fibre-glass. This figure is ideal for use in a farmyard scene and looks great with our other animals. This is an ideal POS model for trade-shows, exhibitions and farm shops to promote your Goat's milk or cheese. The Goat has a textured resin surface which looks very life-like. They would fit into any farm yard/countryside themed areas in adventure golf courses, zoos, theme-parks or to promote shops, businesses, pubs, restaurants. It would even look fabulous in your own garden.